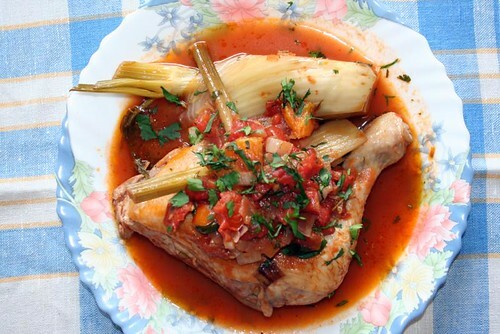 Chicken with Fennel » This, Preparation, Chop, Fenchel, Sautee, Huhn » tobias cooks! This simple dish is ideal when you are short of time as I am at the moment. Not only that it does not consume much time, all you need for this meal is a large frying pan with a lid or a casserole. This saves you time cleaning up. I like chicken, especially when it is a good organic chicken. The fennel combines very well with the chicken and serves as a side dish. You need a casserole that you can put on the stove or you have to use a big frying pan wiht a lid. Put salt and pepper on the chicken parts and fry them in the pan until they have a good gold brown colour. Take them out of the pan and put them aside. Poor all unnecessary oil out of the pan. Now put the finely chopped onion into the pan and sauté lightly for a few minutes on medium heat. Add the crushed fennel seeds and the chopped garlic. Sautee for a few minutes and add the fennel cut in quarters. Now add the wine, the orange juice, the tomatoes, the bay leaves, the saffron and the chilli. Put the chicken in and simmer covered for 45 minutes. For the last 5 minutes I remove the cover and let the sauce reduce a little bit. The dish is done when the meat falls off the bone. Chop some fresh cilantro, sprinkle over the food and serve. you can find the german version of this recipe “Huhn mit Fenchel” here. AMAZING!! That combination of the fennel with the chicken must be wonderful! Log in | 73 queries. 0.526 seconds.